Dog Lore: The Impact of the Stories We Tell | All Around Dogs Dog Lore: The Impact of the Stories We Tell | Thoughts on training and life with dogs. Humans, by nature, are storytellers. We cannot help but tell stories about the dogs in our lives. As the years pass, we build a collection of stories that we use to represent and describe our dogs to others. They may be entertaining, or sad, or somewhere in between but they are all informative in some way or another. Right at this moment, you can think of several – the stories you tell to your vet, your trainer, a friend at a party. But are those stories helping or hurting you? We naturally derive a greater meaning from stories, but what if we’ve assigned the wrong meaning to them? What happens when you say “My dog is dumb because…” or “My dog can’t do X because…”? Is that true? Are you sure? In the book With Winning in Mind, Lanny Bassham states “What you say is not important. What you cause yourself or others to picture is crucial.” He was speaking about self-image, but it applies to your dog as well. These stories have an impact on how you view your dog – their state of mind, their potential, even your relationship to them. The stories you tell create a filter and that filter colors your interactions and expectations. Is that filter giving you a proper picture of your companion or is it skewing your view? #1: When Dash was about 2 years old, he got into a potato and sausage casserole that was cooling on the stove (don’t ask about that recipe… yuck). I had tucked it back and to a corner, thinking it was out of his reach, and then stepped away to take care of something. I came back into the room several minutes later and caught him in the act, nearly the entire 13×9 pan already emptied. He was quite skinny at the time so his stomach was bulging in an almost comical manner. Once his binge started to hit him, the only thing he wanted to do was lay in my lap (oomph!). His stomach was audibly gurgling and when I put my fingers in the spaces between his stretched out ribs, I could actually feel the gas bubbles going by. Afraid that he might get ill during the night, I slept on the couch with him. Thankfully, the evening passed without incident. The next morning, when he came back from his morning trip to the yard, he was all thin and bouncy again. I was a little worse for the wear, but he came through just fine. The not-so-mysterious case of the disappearing uptuck. It reappeared the next morning. Does this story help or hurt? Short-term, I learned a valuable lesson about his reach and we decided to lower his thyroid medication by .05mg since he was getting food crazy. Long-term, this story is more benign than anything. It is a typical dog lover’s story of a naughty dog and a good reminder that “tucked into a corner” isn’t necessarily out of reach. 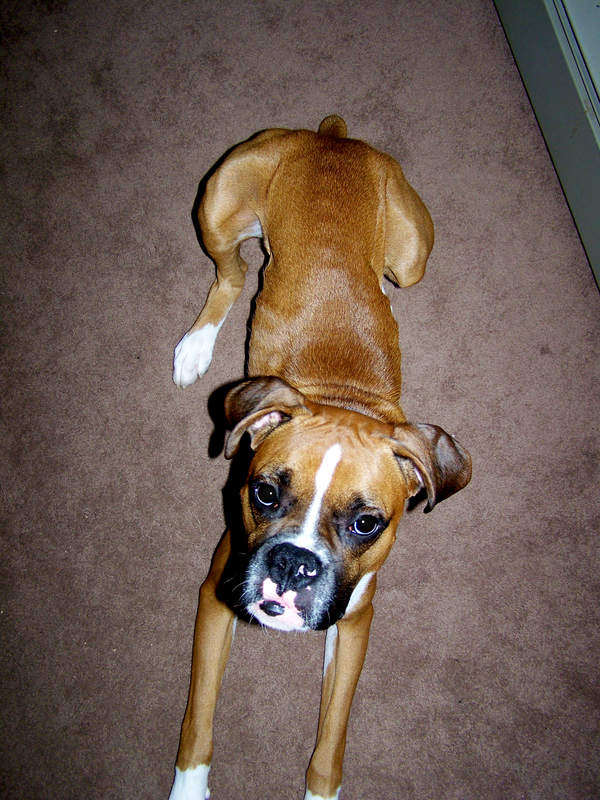 #2: As soon as Dash got the medical all-clear for his sterile meningitis in July 2007, I wanted to get him into obedience training. We made an appointment for him to get his long-overdue vaccines so that we could register him for the Beginners class at my club. After we got him home from the vet, he began vomiting and continued to vomit for 12 hours. He didn’t like to vomit in the house so he insisted on being outside the entire time. Once it was clear it wasn’t ending anytime soon, my husband and I set ourselves up to watch a movie on the deck and keep him company. After the dew and the dark had fallen, he’d stopped retching and began to shiver so I finally coaxed him inside. 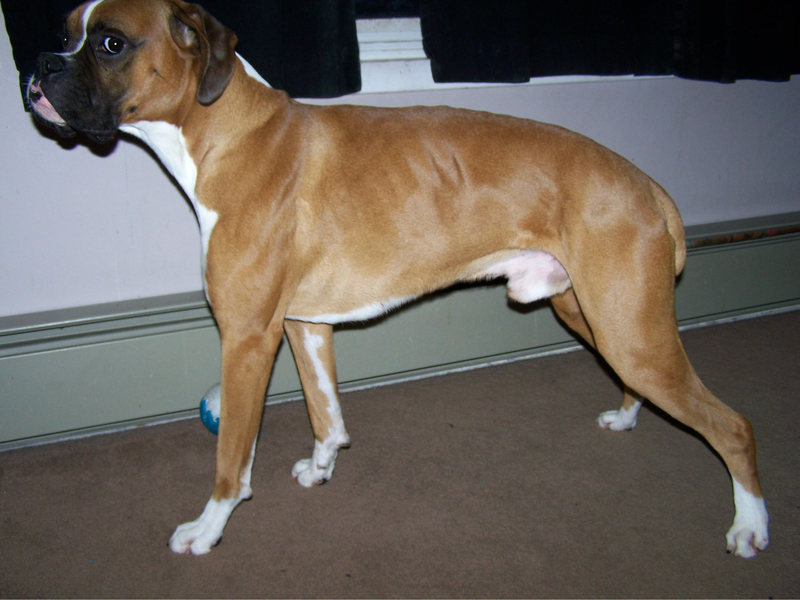 When I weighed him next, his already skinny frame had lost a total of 5 pounds. He looked like a skeleton in a dog coat and it took us months to get his weight back up to a reasonable level. 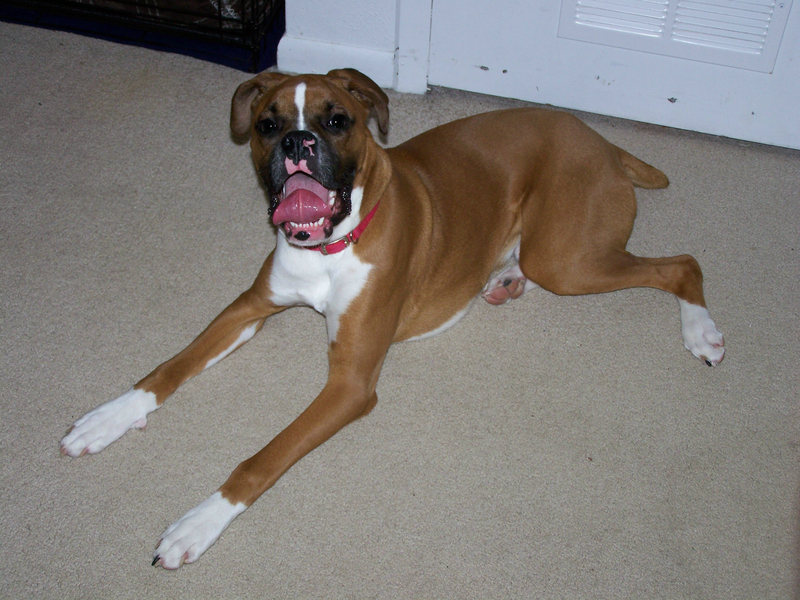 Dash approximately one month after his vaccine reaction. Does this story help or hurt? To me, this story is vital to our approach to his health and veterinary care. This incident is the reason that he has a medical exemption from all vaccines. It made me cautious about what chemicals I gave him and encouraged me to search for more natural treatments when possible. The casserole incident showed me that he’s not always sensitive, but the vaccinations showed me how violently his body reacted when it did decide to react. I will admit that occasionally it made me a little too nervous about his health and introducing new things, but overall I would say my caution was proportionate to his needs. #3: Dash’s first owners were an elderly couple who got him as a birthday gift. When he was 7 months old, they put an ad in the paper that listed him as “free to good home, needs room to run.” We met Dash paws first as an elderly woman tried in vain to hold him back by his ill-fitting collar. He didn’t appear to know his name or any commands and they “corrected” him by smacking a newspaper into their hand by his face. They told us he hadn’t had any socialization because their friends all had little dogs and he was too rough. He wasn’t being exercised. They had been letting him run in the basement, but then he started ripping down their laundry from an indoor line. The wife (who was home all day) couldn’t walk him safely, so he was being tied out on a 6ft leash to do his business several times a day. When I gave his background to one vet and later to his boarding kennel, they said he missed his key socialization periods and he would never really learn to be appropriate around other dogs. Obviously he was quite traumatized by it all. Does this story help or hurt? While I don’t feel I’m using this story in a harmful way, it had the potential to distort my thinking. When I described the couple’s futile training methods to one person, they acted as though I was describing abuse. I wasn’t – the couple was clueless, not abusive. But imagine if I had? How would I have treated him if my first thought was “oh, poor baby, he had such an awful start in life” and how would that have effected our goals? There were moments when I believed what the “experts” told me, that he wouldn’t be able to learn his missing social skills. Thankfully, those were outnumbered by the times that I accepted that he wouldn’t be as socially fluent as other dogs, but still felt he could learn the skills. He worked out how to share a house with Xena when he first came home. He might have been a bit coarse and clumsy but she was able to tell him what worked and what didn’t. Throughout Delta’s puppyhood, he gave her leeway and fair warnings when her antics pushed polite limits, just as an older dog should. If anything, he’s a bit more lenient with her than other dogs may have been. Maybe someone could say he allows more because he doesn’t know better, but I’m fairly certain he knows what is and isn’t appropriate. I think he just lets things slide because he’s worn out from fending off our little force of nature. I’ve given you my examples, what about yours? What are the stories that make up your dog’s lore? Are you using them to define your dog? Do they limit your efforts or your dog’s opportunities for success? How do they change how you treat the dog as s/he exists in the here and now? We cannot stop telling stories, and we shouldn’t, but we can be careful about how we paint the picture in our minds. Don’t choose the filter that is the most compelling or flattering – pick the honest one that best serves your dog. This post also appears in the February issue of the Boxer Daily. Wow, how fortunate that you adopted him! These are great stories, and I love how you’ve turned them into life lessons that can help others as well. As an author of dog books, I’m always telling stories–so I find your post today especially interesting. I often tell about my spaniel-mix’s escapades slipping out a porch door and chasing after some ducks. She swam out too deep in the lake, requiring her to be rescued in a rowboat. I describe her as “naughty.” But actually she is not a naughty dog, that was just one slice of life, and she was following a natural instinct to chase those ducks. It is a reminder to us to be vigilant, even when we thought she was safely behind closed doors on the porch! I’ve been trying to use the term ‘reactivity’ much less because I don’t want it to end up defining my dog. When I look at so many other dogs they’re reactive as well – but to different triggers. I’m glad Dash ended up with you; it sounds like the perfect pairing. Excellent point. Thinking about it, I tend to describe Dash in other terms unless I’m specifically talking about his issues. “Well intentioned but extremely rude” is a frequent one because he has no malice but also no manners! Dash is so fortunate to end up with you! It’s funny all of this ‘compartmentalizing’ of dogs – if we did that to humans we’d be in trouble! Dog’s have tons of various personality traits – sometimes we are just fine and at other times, we get in to a bit of mischief. We, like humans, just need love, caring, consistency, and patience! Bless you heart! I’m so glad Dash ended up with you. The first two stories serve as such an important reminder that our dogs can have solid stomachs, but still react so negatively to something common. I love that quote so much and I want it everywhere. I highly recommend Lanny’s book if you haven’t read it. I have the audio version and it’s like your kindly grandfather reading to you. I don’t do all the written affirmations & structured program steps that he talks about, but I’ve changed how I talk and frame my thoughts (when possible) largely based on his advice. Proof that the right dog winds up with the right people. Win.Win.WIn. This is a really interesting perspective. I think the stories and lore are only worth repeating if they help us to be better or take better care of our pups. Thank you for sharing! I’m so glad that you and Dash were able to find one another. One thing that your stories tell me is that you are very passionate about Dash. You notice and remember small details that others might miss. Any time we truly care for someone, we begin to notice everything about them. A story from me? Well, I only have cats, but they do have a lore all their own. To make it short and sweet, my younger cat, Manna, was only 3.5 weeks old when we adopted her and we had to keep her in the bathroom because she had fleas. One day we heard her yelling from inside the bathroom and when we went in to look, she had fallen into the toilet and was too small to get back out. Of course, I got her out of the toilet bowl and gave her a nice warm bath. To this day, we keep our toilet lid closed! This is a wonderful post! I have never thought of my dogs “lore” in these terms. So interesting! Great article. I found the 3rd story interesting. Experts say a lot of things. Dogs are smart, even the breeds not known for their intelligence. In socialization especially because no matter how old other dogs will teach them the appropriate behavior. And with good guidance, rules and boundaries by the owner this can be accomplished at any age I think. Obviously there are exceptions to the rule. My point is experts are not always right every time. Ceasar is considered an expert yet as far as my Border Collie goes (I say mine because I can only speak for mine) I would disagree with almost all of his methods and reasonings for training.